The church's vestibule is decorated with the scenes of the murder of Abel and of the Devil playing tricks on people. The Devil in the dog's guise drinks milk from a milk pail to bring it to a man who sold him his soul, demons sit on balky horses, demons help executioners torturing a martyr, demons help their servants during field works. In the church itself the murals begin at a shoulder level and cover all walls and vaults. The columns, placed in two rows in the central part of the church to support the vaults, are decorated with big images of individual saints and apostles. 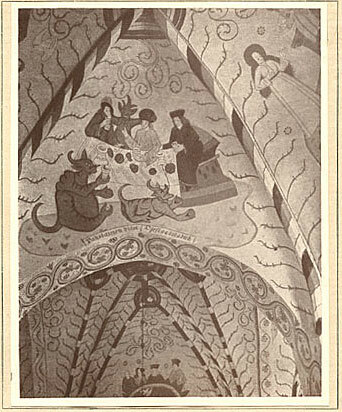 Large surfaces and vaults are covered with pictures of the Paradise, scenes of the Leading Forth from Hell, Stoning of the Harlot, genealogy of Christ, Christopher the God Carrier, Virgin Mary and several scenes from Passions of Christ. Among saints most often we see the images of St. Catherine of Sweden (canonized in 1479) and St. Henry with Lalli his murderer. The paint was put across wide plains within clearly outlined folds. The figures are framed by ornamentation. Empty spots are filled with stars. The background is white. There is no question for me why they needed such clearly outlined images on a light background: with original sizes of low and narrow windows and given the height of the church a decoration was certainly required. The gloom of the church is likewise comprehensible. Church, being a spiritual fortress, a shelter from the enemy, should be immersed into intimate twilight.